Many years ago I was manning a stall for Sage, Oxford’s Christian environmental group, at the annual Green Fair in Oxford Town Hall. One of the visitors to the stall was Andrew Linzey, the leading Christian animal ethicist. Andrew was concerned that, in his view, Christian environmentalists at the time were not very interested in animal welfare. I argued that the environment and animal welfare were rather different, but related topics and that different people would be drawn to concentrate on one area or the other. But, to be honest, I hadn’t given the topic much thought up to then. Sometime later my wife, Margot, and I were asked to co-lead a module in environmental ethics for Oxford Brookes University. The module ran for several years and it helped me really develop my thinking in this area. I came to realise that the dominant environmental ethic was ecocentric where the whole environment is the major focus, while animal welfare ethics is predominantly biocentric (or perhaps more correctly zoocentric) where individual animals are the focus. Most animal welfare ethics concerns domestic animals, but sometimes they interact with environmental ethics in natural environments. Last year Margot and I used our experience in environmental ethics to produce a Grove Booklet “An Introduction to Environmental Ethics”. I was designated to write a section on the interactions between environmental ethics and animal welfare ethics (in the web resources downloadable for free from the website). There I tried to sketch out the main areas where the two ethics interact. The biggest of these interactions, to my mind, concerns conservation management, and particularly what to do about invasive animal species. This whole topic was brought into very sharp focus at the May 2017 CRES day when Selwyn Yeoman of A Rocha New Zealand spoke about conservation issues in his country. 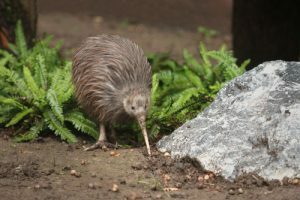 Their biggest concern is invasive species, mostly possums, stoats and rats, which have had a devastating effect on New Zealand’s native fauna, driving many species to extinction. The New Zealand government has now set the ambitious target of “Predator Free 2050”, encouraging government at all levels, NGOs and individuals to help in dealing with the problem. This will involve killing very large numbers of animals over an extended period. With the possums, it might be possible to capture some of them to release them back in Australia where they are native and in serious decline. But if it were possible to capture all of the rats what would be done with them? In the last few years, there has been increased interest in animal welfare ethics through initiatives such as Creature Kind and Sarx. The prime movers behind so-called “Creaturely Theology”, theological reflection on non-human animals, have been Celia Deane-Drummond and David Clough. Most of this activity has concerned sentient domestic animals, with those in the wild receiving less attention. The next stage will need more work on the ethics of animals in natural environments in the near future. So I have a lot of questions. How do environmental ethics and theology relate to animal welfare ethics and Creaturely Theology? Is Creaturely Theology a part of environmental theology, a dominant theme, a related area or are they totally separate? Can we reconcile biocentric and ecocentric ethics? How does all this play out in real environmental situations like New Zealand? I think I can frame the questions better than when I had my conversation with Andrew Linzey, but the answers are still elusive!